As part of their leadership training week, 170 Grace College student leaders participated in “Incarnate: Love Made Visable” this past Wednesday, August 17. The event, coordinated by Scott Feather, associate dean of character and leadership development at Grace, was planned in conjunction with the local United Way’s “Day of Caring” which brings organizations and individuals together to assist in local needs. Students served throughout the day, doing projects with organizations such as Housing Opportunities of Warsaw, the Salvation Army, and Combined Community Services. Local businesses donated food and supplies. Students painted, repaired, mowed, and cleaned. 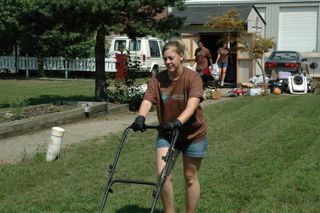 Grace student Kara Gunder (pictured) was among those participating. Some organized a carnival at the Salvation Army for kids who came to get school supplies and others visited nursing homes. One group was so well-received at a local nursing home they were invited back for the weekly karaoke night. Wednesday evening, the students and those they served gathered under a beautiful summer sunset at Winona’s Hillside Amphitheater to share about the day. There was laughter, and there were even some tears, as the impact of the day was put into perspective.